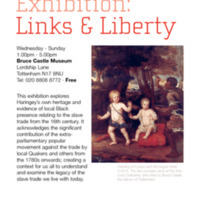 An exhibition at Bruce Castle Museum (in partnership with Euroart Studios) explored the transatlantic slave trade, Haringey's heritage relating to the trade and its legacy, and the historic Black presence in the borough from the 16th century onwards. There was a particular focus on the painting of Lucius and Montague Hare, sons of Lord Coleraine (former owner of Bruce Castle), with their African servant. The exhibition also looked at the extra-parliamentary popular movement against the trade by local Quakers such as Priscilla Wakefield and others. Contemporary dance workshops for secondary schools were led by dance company Movement Angol. The Links and Liberty exhibition included 'Stolen', a life-size installation by artists at Euroart Studios (John Fowler, Lorraine Clarke and Nigel Young) of a section of a slave ship. School pupils were encouraged to climb inside to imagine conditions on board. Liverpool is a port city with a long association with transatlantic slavery. Located on Liverpool's Albert Dock, National Museums Liverpool opened the new International Slavery Museum in 2007, the first stage of a two-part development. 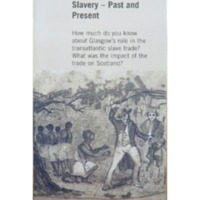 The museum aims to promote the understanding of slavery and the transatlantic slave trade and the permanent impact the system has had on Africa, South America, the USA, the Caribbean and Western Europe. 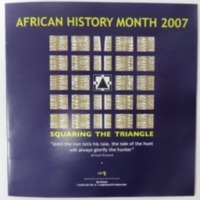 It features displays about West African society, the transatlantic slave trade and plantation life, but also addresses issues of freedom, identity, human rights, reparations, racial discrimination and cultural change. 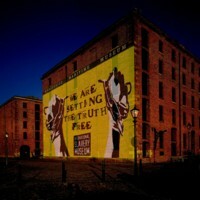 The museum also has strong ties with Liverpool’s large Black community. 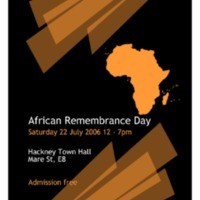 The museum opened on 23 August 2007, designated by UNESCO as Slavery Remembrance Day. 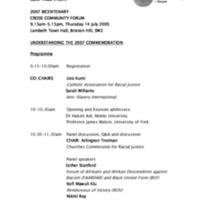 The main aim of the 2007 Bicentenary Cross-Community Forum (2007BCCF) was to facilitate space for dialogue and alliance building in areas of work connected to the legacies of enslavement, related global injustices today and contemporary forms of slavery. The forum was jointly convened by Rendezvous of Victory, Anti-Slavery International and the World Development Movement. The education initiative aimed to assist in discussion and alliance-building on issues arising from the legacies of African Enslavement such as Maangamizi (Afrikan Holocaust) Awareness, Afriphobia, reparations, global injustices today and contemporary forms of enslavement. Open meetings were held in London between 2005 and 2007, and the group produced the 2007 Cross-community e-bulletin three times a year, including comment pieces about the significance of 2007. Task Action Groups were set up, such as the Cross-Community Dialogue Action Group on Education (CCODAGE), jointly hosted by the Council for Education in World Citizenship and the School of Education at Kingston University. A Global Justice Forum was developed out of the 2007BCCF in order to advance work beyond 2007.